A PROFILE OF 4 SQUARES: RAVE REVIEWS! You can also read more about the show in the Oak Book’s online magazine. Be on the lookout for viewing portions of the profile in the parks’ neighborhoods. 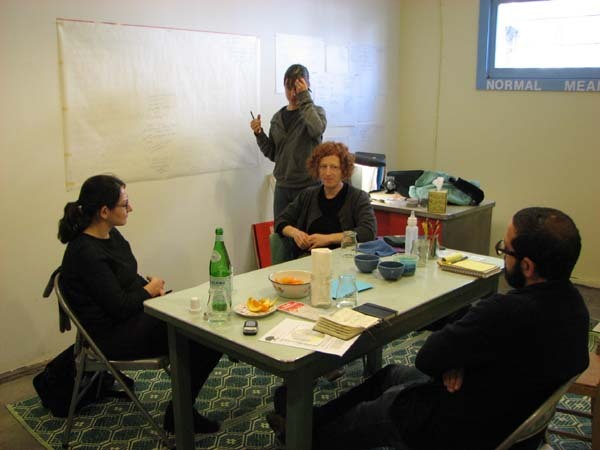 We are working on the details for presentations both in Old Oakland and in the Lincoln Rec Center. And coming soon: the mapping of the 10,000 Steps self-guided walking tour! 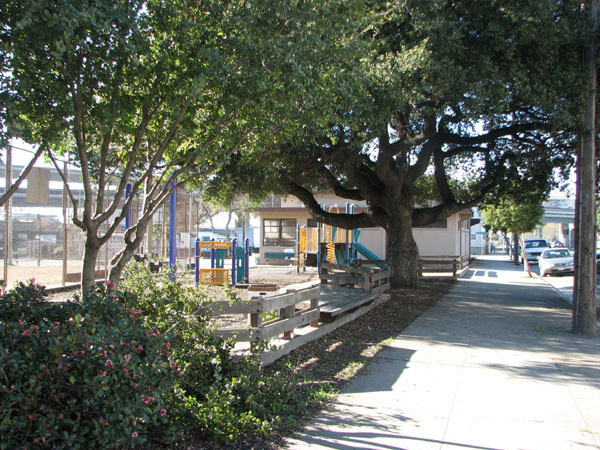 The City has future plans to renovate Jefferson Square Park. The first phase is slated to break ground this fall. The Rec Center, which hasn't been used since the 1970s and is deemed earthquake unfit, will be demolished to make room for a new dog park. The community, which is full of neighbors with dogs both large and small, advocated for this new park feature. The community also expressed an interest in a commemorative marker. 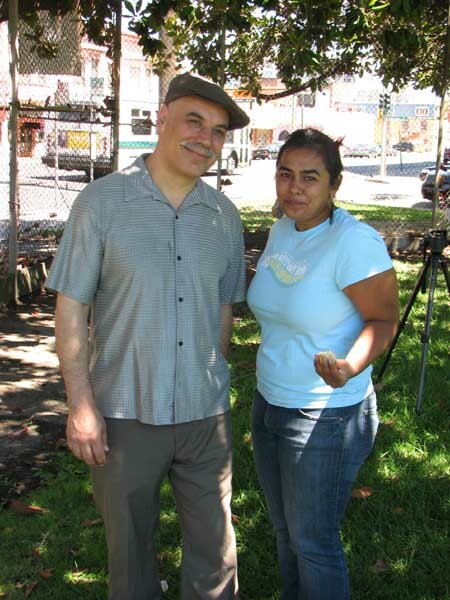 We have been working with Old Oakland Neighbors, community members and the City to develop a plaque that will pay tribute to the largely Latino community who lived in this neighborhood since the 1940s. The plaque will also honor the varied vital roles that the Recreation Center played in life of the community. 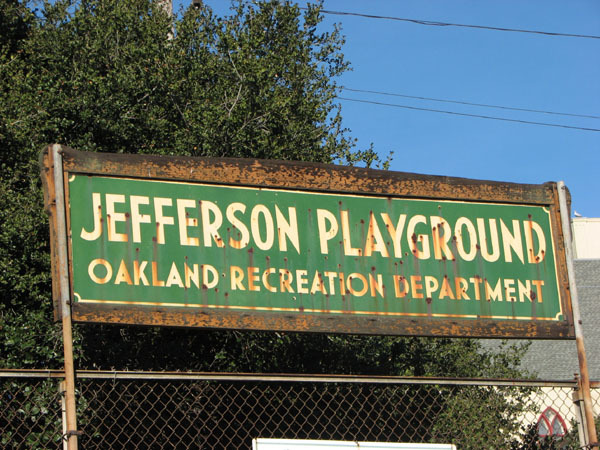 Since Lafayette Square gets a lot of regular attention from the community, we decided, with Old Oakland Neighbors, to host a day of games, story telling and surveying at Jefferson Square. 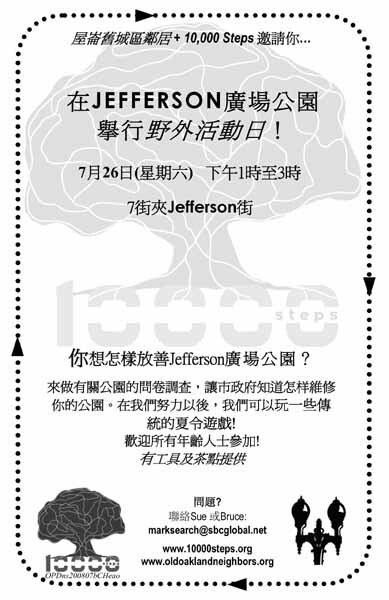 The city generously translated our flyer into Spanish and Chinese; we distributed the flyer throughout the 50-block region that hugs the four historic squares, spanning west to east from Martin Luther King Jr. Way to Madison Street and north to south from 11th to 7th Streets. We were hoping to draw a diverse crowd. 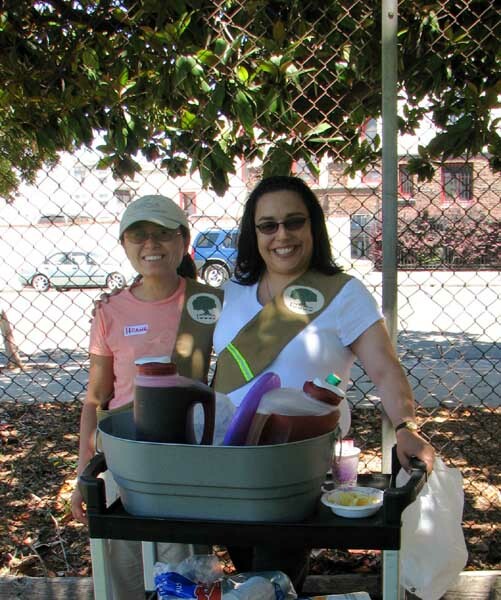 Tina and Hoang, our Old Oakland 10,000 Steps representatives, helped with organizing the event, getting the word out, and thanks to La Boriquena, Tina’s family’s business, we had delicious agua fresca. And to satisfy summer-time tastes, we also had some sweet, cold watermelon. We were all ready for some ‘old time’ field games, like tug of war, three legged races, water balloon tosses and Frisbee. But, since the day was sweltering, most everyone huddled in the perimeter shade generously offered by some grande flora magnolia trees. While sucking on ice cubes and spitting out seeds, neighbors shared their memories of the park, the rec center and the old days when there were houses surrounding the park. As we were told, eminent domain was enacted to build the freeway, BART tracks and the jail; as a result many families who had been in the neighborhood for generations had to move elsewhere. 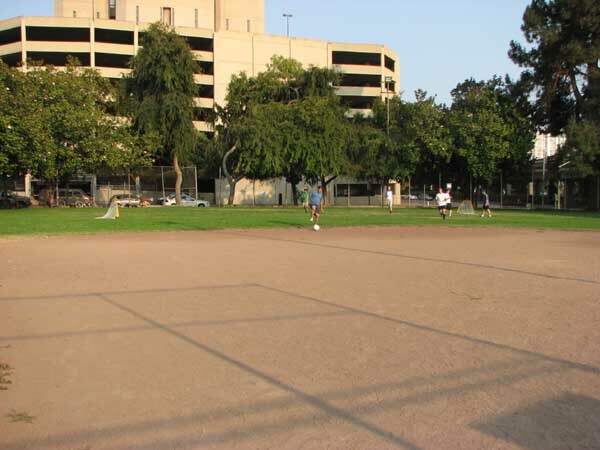 Now the park has a vaguely abandoned feel, though it is well-used for softball, baseball, soccer and basketball games. Whether you see people there just depends on when you walk by. Gus, owner of the Shoe Spot on the corner of 7th and Jefferson and long-time neighbor, has lots of nostalgia for the park and the rec center: “I’d like to see them bring back the Rec Hall. That’s what would give the park life again…The Rec Hall used to be open 10AM – 10PM and all you had to do was leave a valuable chichagua for a ball---a sweater, an ID, your wallet, anything of value and they gave you a ball to play with, to play basketball or volleyball or tennis against the wall or a bat and glove. 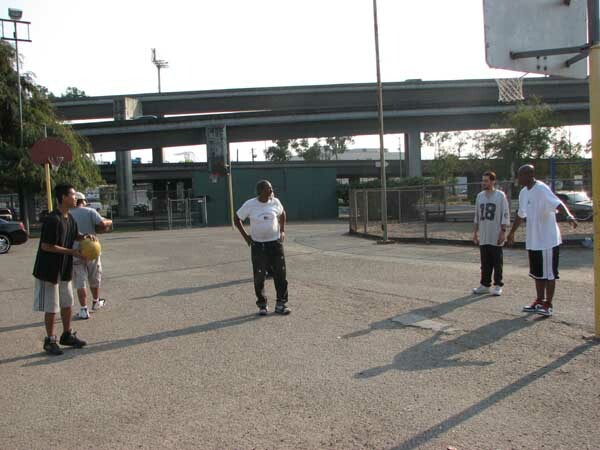 The Rec Center gave the park life.” This neighborhood used be the heart of the Latino community; a number of years ago through the efforts of the Unity Council and the Oakland Museum the Latino Project emerged. 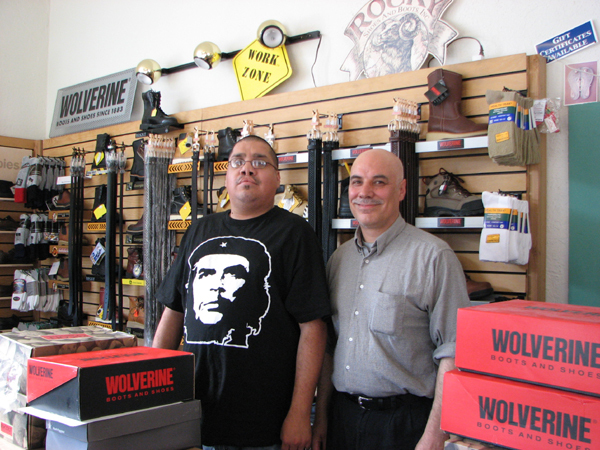 Interestingly, we have learned from Oakland historians and folks in the neighborhood that the Latino history of this particular local community has not been well preserved. 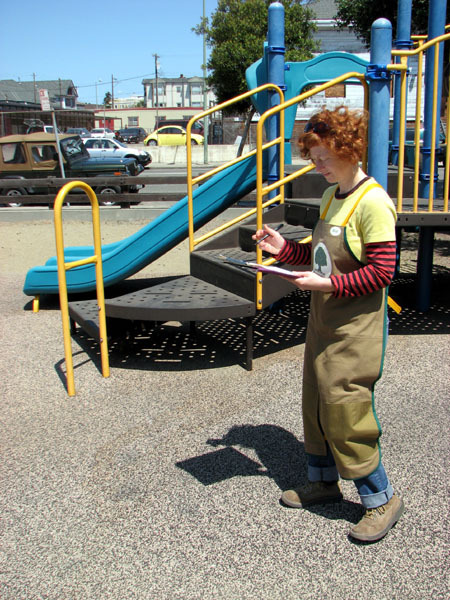 We asked those who came to the park to complete a detailed needs assessment survey of the park. 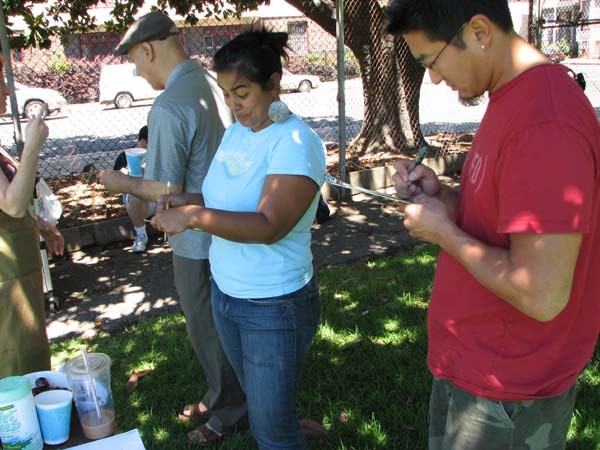 The Oakland Parks Coalition holds an annual volunteer park survey event in October to assess the condition of all of the parks in Oakland (more than 200!). This is especially critical as city funds for parks maintenance disappears. Through the development of a volunteer stewardship program and friends groups, communities need to be the caretakers of their local green space. 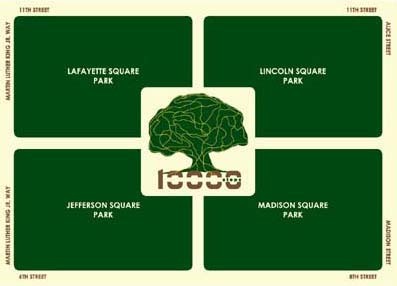 Today’s average ratings were a ‘5’ out of ‘10’ and one person described Jefferson as a “lonely park” and another wants to “bring the park back to life! Have a Rec Center!” We sent all of the detailed surveys to the Parks Coalition and they added the data to their reports. Also, our ‘Needs’ section of the website is used by the Parks and Recreation Department. For some, this was their first time in Jefferson Park! Someone wondered if the way we used parks 40 or 50 years ago was different than how we use parks today. Her main question: What will draw people out of their homes and into the parks? Another person we met in the park said that he has been coming here every day for the past 20 years. He likes to meet his friends in the park, people who used to live in the neighborhood. We gave everyone who completed a survey a salvia plant for their garden. 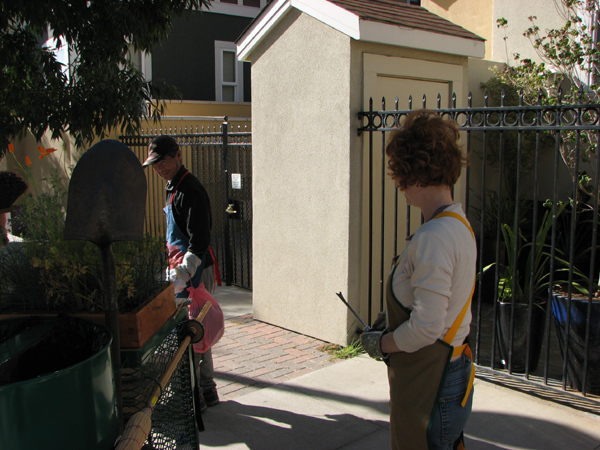 The plants were donated by Merritt College’s Landscape Horticulture Department. 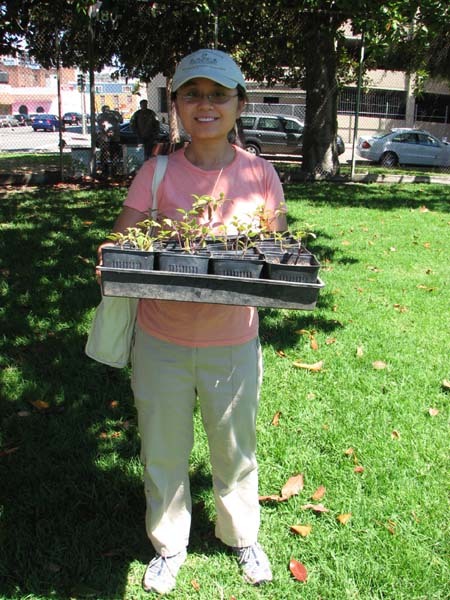 Hoang took home the extras to plant in the Lafayette Square community garden. Unfortunately, there isn’t anyone planting a garden in Jefferson yet. 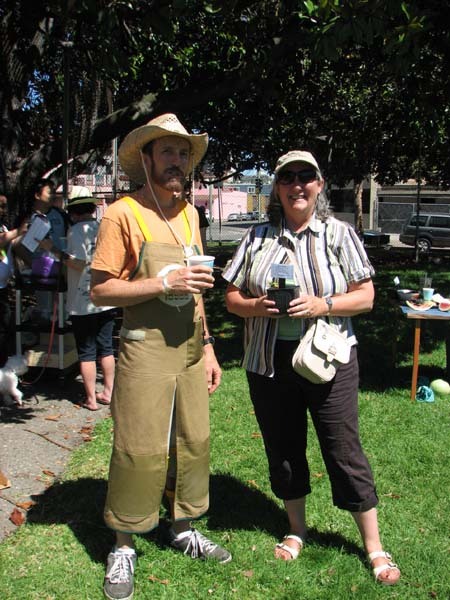 Annalee Allen, who runs the city’s Downtown Walking Tours program, stopped by to see what we were doing in the park. After we wrapped up in the park, we walked across the street to Saint Mary’s Church closing event. 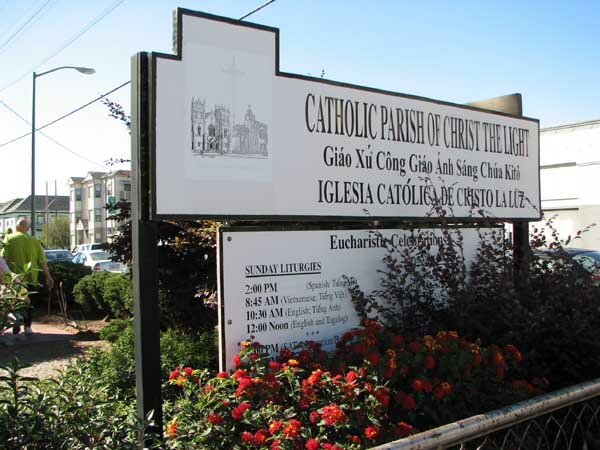 The closure of the church, due to the building of a new church by Lake Merritt, was a severe blow to the local neighborhood. The church was packed, standing room only, with a diverse audience that represents the mix of the neighborhood over the years. 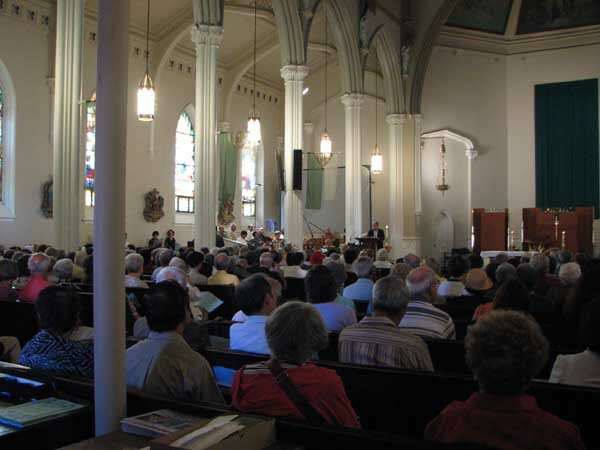 The priest, whose speech was peppered with Spanish, had been with this congregation for many years; he reminisced about La Calle Siete, Seventh Street, the Latino barrio and listed a number of hotspots, some of which are no longer around: the Star Theater, Sweets Ballroom, La Boriquena, Mexicali Rose, and other restaurants. This was truly a neighborhood church. We have been talking with Tina Tamale, who knows everyone there is to know in the neighborhood, about Jefferson Square Park, trying to get a handle on this park. We were having a hard time understanding its ‘personality’ because the park always seemed desolate when we walked by. 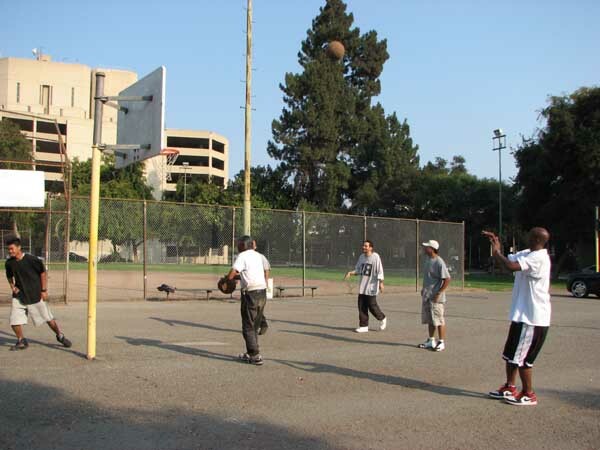 The park, elegantly bordered with Grande Flora magnolia trees and sweeping eucalyptus, is dominated by several large playing fields for baseball, soccer and basketball. We have yet to see any action. To learn about some of the park’s past, she told us that we should meet her childhood friend, Zazu, aka Roy Byrd. So, we made a plan to meet Roy at the basketball courts. 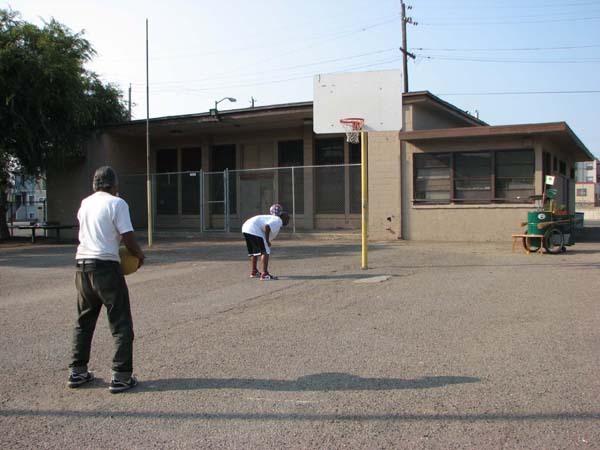 We arrived early and saw an older gentleman getting ready to play, ball in hand. Turned out this was none other than the infamous Boone, an amazing basketball player who has both tended the courts and the neighborhood kids for decades. Tina and some other folks in the neighborhood had told us about Boone, but we hadn’t gotten any info on how to contact him or where to find him. We introduce ourselves and told Boone that we were meeting Roy. He was very excited: they hadn’t seen each other for some time. Boone has been coming to these courts on a daily basis since the 1940s: he is there every day, from 4-6pm except for Friday, which is ‘family day’. 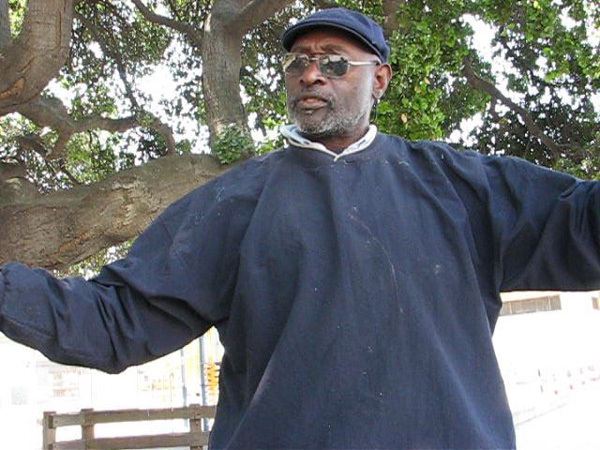 Boone, whose well-worn black jeans are adorned with foreign coins, was a longshoreman. 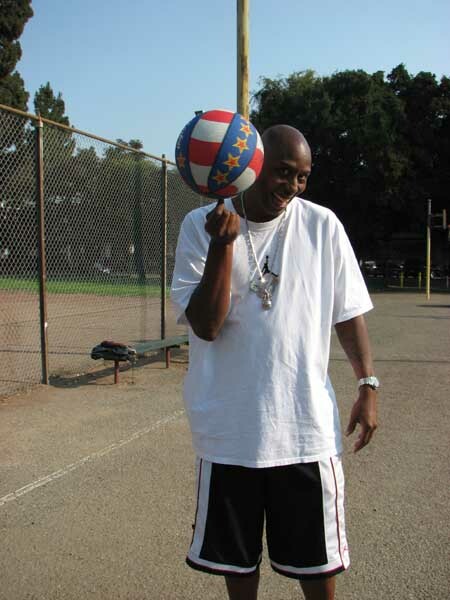 He began playing basketball with the All Nations team along with other Oakland ‘superstars’: Lionel Wilson, who was Oakland’s first black mayor for three terms (1977-1990), and George Scotland. Boone started playing ball at Jefferson in 1948 when the deFremery’s courts were being renovated. When Byrd arrived, it was a joyful reunion! Boone and Roy agreed to sit down with us on camera to reminiscence; it was simply a pleasure to see how much the two of them enjoy and respect one another. Roy attributes his success in life to his relationship with Boone. When Boone was in town, all the kids would hang out in the park all day and long after dark. Their parents knew that if they were with Boone, they were safe; he was like a father to all of the kids. Boone told us, “I was a seaman for 45 years. When I’d come off a ship, I’d come down here. I’d spend my time between ships, I’d spend time here in the park. Then I’d catch another ship and go-go.” He started playing ball in his twenties; at over 80 years old, he owes his good health to daily exercise. See the history sidebar to the right for more of their stories about Jefferson Square and its Rec Center. Boone is the court caretaker: when nets need replacing, he does it. The city can’t afford to take care of all of the aspects of the park, so he picks up what’s important for him and the community. 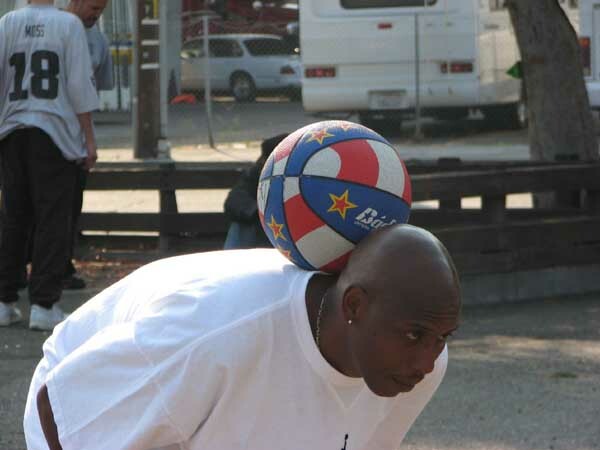 Basketball, learning a focused skill while having fun, is one of his life lessons. Boone made sure that all the kids stayed away from drugs and gangs; and for some, like Byrd, basketball became more than a passion, it became his career. After we were done talking, Boone and Byrd took to the courts. They both practiced their amazing trick shots and even tried to teach us some too! 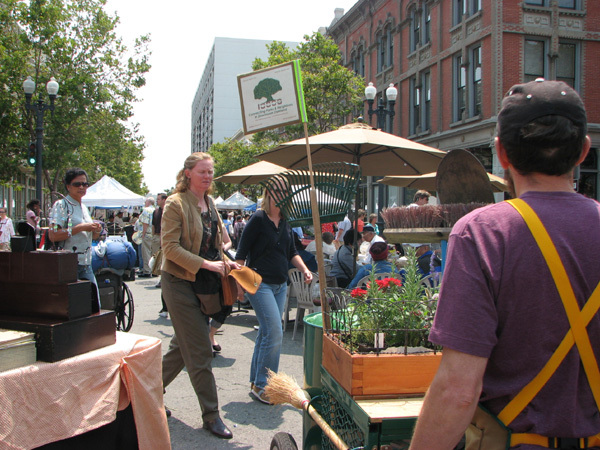 Along with visiting each of the four historic squares, we want to meet and talk to people about the parks in the areas between, so today we visited the Old Oakland Farmers’ Market. 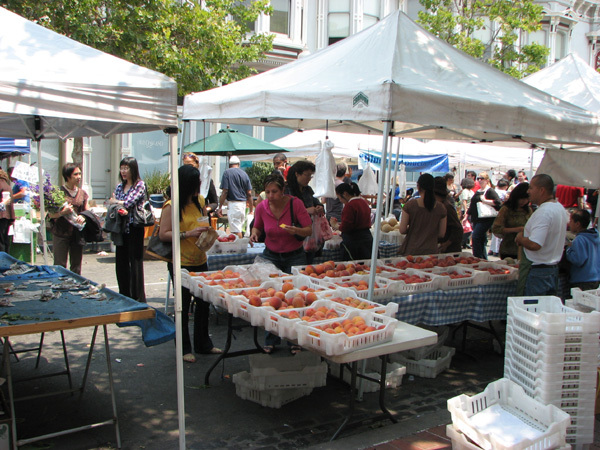 Nestled within the historic architecture of Old Oakland’s Ninth Street, the market is a scenic festival, brimming with produce vendors, prepared food, music and hand-crafted goods. 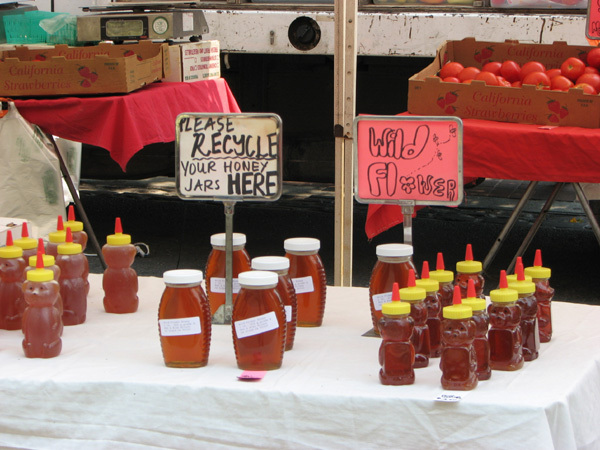 We went around lunchtime and the streets were packed; the market is open every Friday from 8AM-2PM. 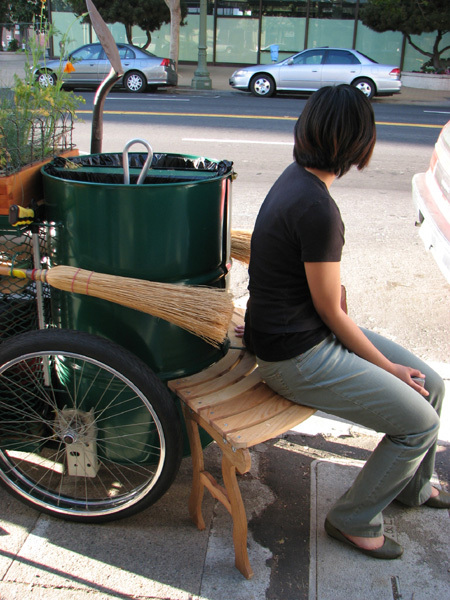 Our cart immediately attracted attention from passers-by, mostly because we had transportable garbage and recycling bins. 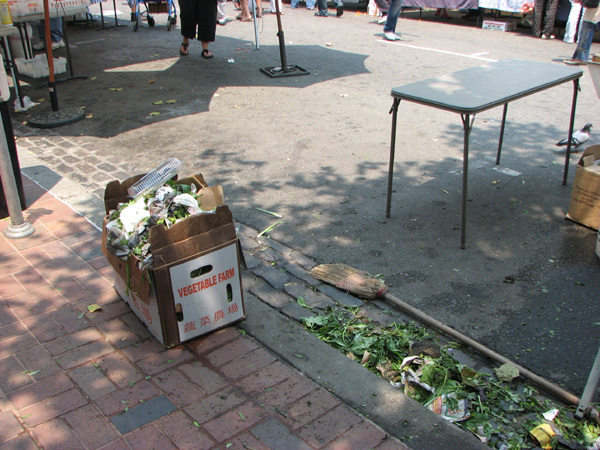 Everyone expressed their dismay at the lack of bins at the market, though the streets were in fact pretty clean. 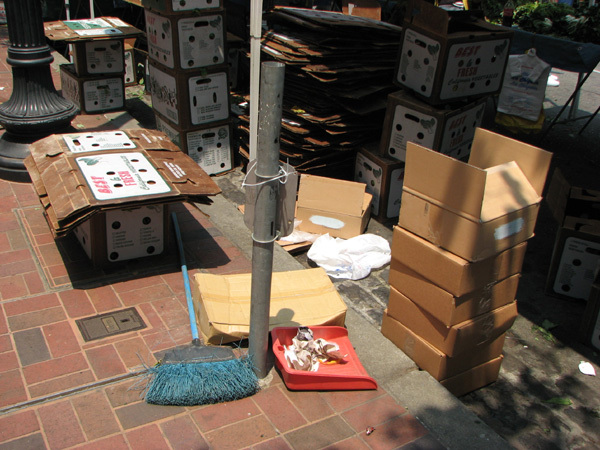 It is obvious that each of the vendors takes good care of their spot. 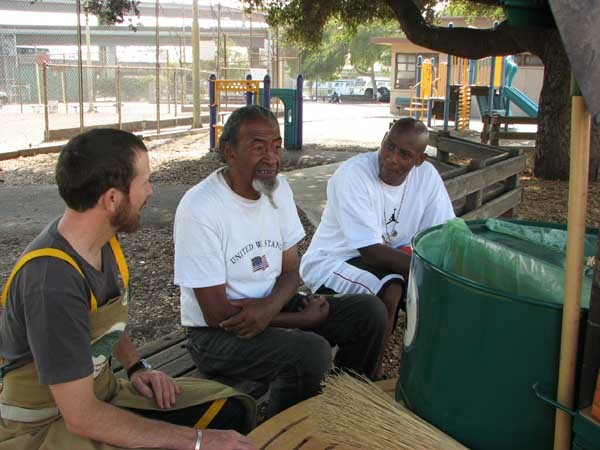 While we were checking on the street trees to see how they were fairing, we ran into William, the caretaker for Swan’s Marketplace, which is part of the East Bay Asian Local Development Corporation. 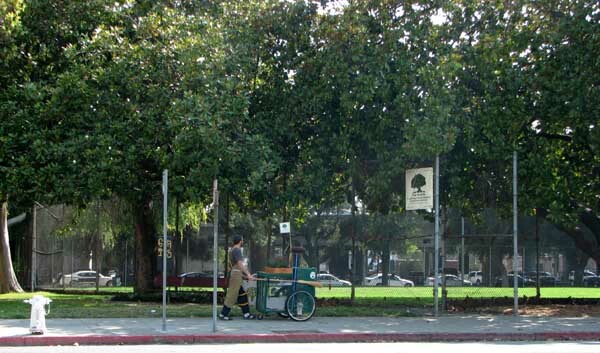 Though he is primarily responsible for the landscaping within the development (which houses MOCA, the Museum of Children’s Art and Swan’s Cohousing), he has been taking care of all of the street trees in his square block. He recently removed all of the posts since they were harming rather than supporting the trees. When we commended him on his good deeds, he proclaimed, “It’s my pleasure! I live on the planet earth! 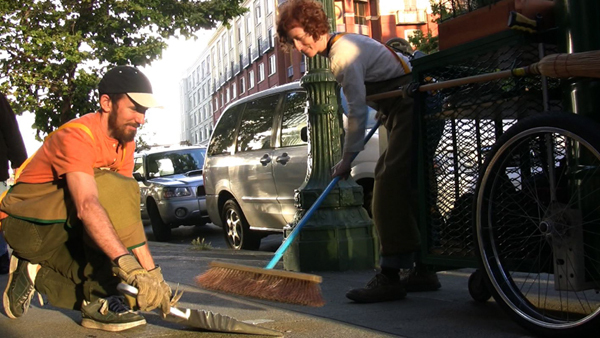 !” He also told us that there are others in his neighborhood that regularly sweep the streets because they care about where they live. Many people we talked to had no idea that there were parks so close by to the market. One vendor told us that she thought kids are less likely to play in parks because they’d rather watch tv or play video games. 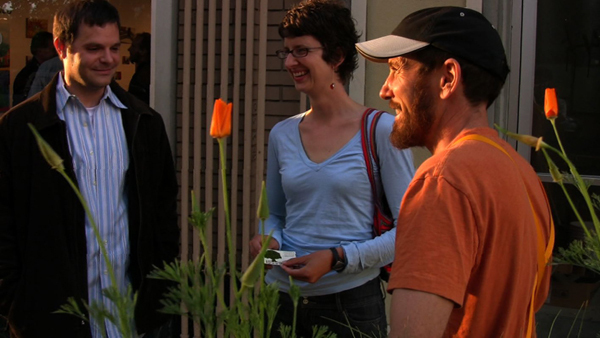 Another shopper told us that she regularly visits community gardens and the Bonsai Garden, a hidden Oakland gem. Some of the miniature trees are over a hundred years old! 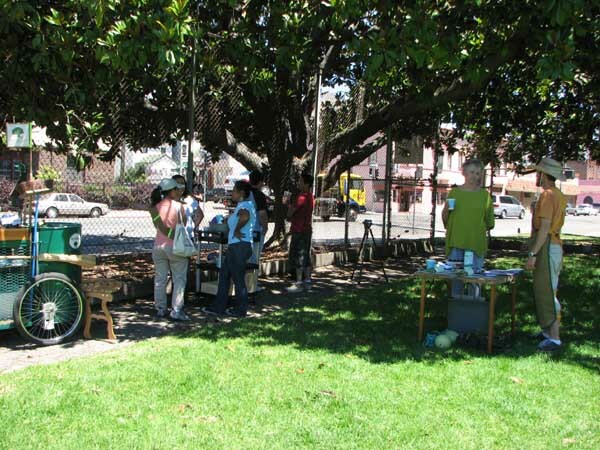 It’s located at Lakeside Park, near Lake Merritt and you can see it Wednesdays -Friday 11:00 am to 3:00 pm, Saturdays 10:00 am to 4:00 pm and Sundays 12:00 to 4:00 pm. While talking about Oakland’s parks, another marketer told us about Cayuga Park in San Francisco, a little-known green spot that has been dearly tended for more than 20 years by a Filipino gardener/sculptor. Demi, as his neighbors call him, has landscaped and decorated nearly all of the 11-acre open space. 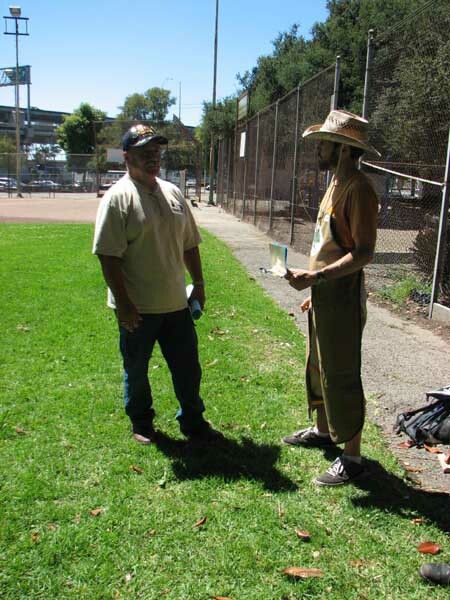 His recent retirement dismayed park users and neighbors; they recently banded together to preserve the park since the City doesn’t have the funds to hire another gardener. After talking with people in the market, we had some delicious tamales and veggie rolls. 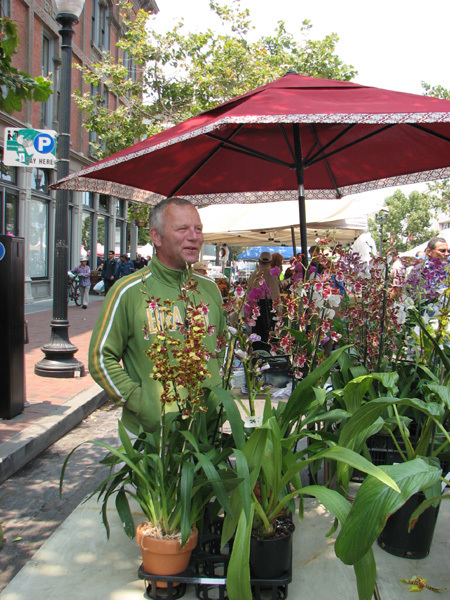 We highly recommend a visit to this vibrant and festive urban farmers’ market! 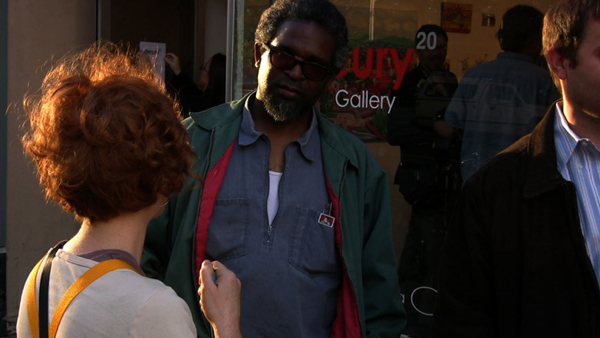 We headed out to explore Oakland’s Art Murmur, a monthly event on First Friday evenings. Downtown galleries open their doors, streets are closed off and all kinds of people from all over the Bay Area come to this energizing urban experience The closest gallery, at Grand and 25th, is a bit beyond our stewardship zone. But we wanted to reach a different audience and talk to them about their relationship to Downtown’s parks. We covered walked over 5,000 steps! Before heading off, we stopped to talk to long-time neighborhood resident, Gus. 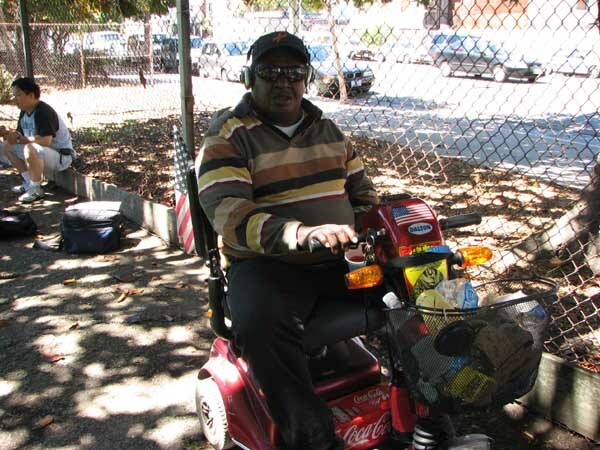 He has been running the Shoe Spot, across from Jefferson Square Park, for the past five years. 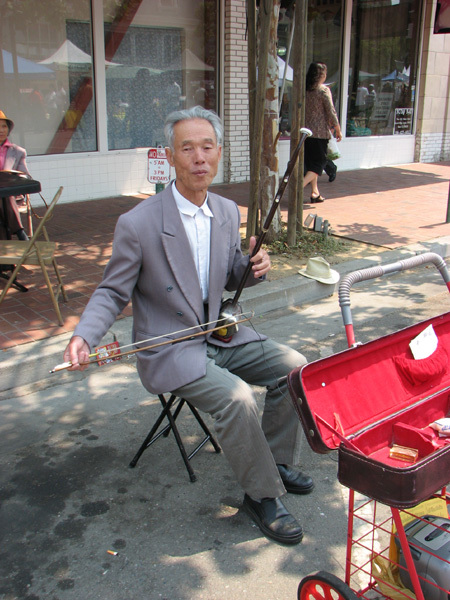 He told us stories about the cultural archeology of the neighborhood: it was once the Latino center of Oakland, with lots of theaters and restaurants. He grew up in the neighborhood and spent a lot of time in Jefferson Park and is sad to see its decay. 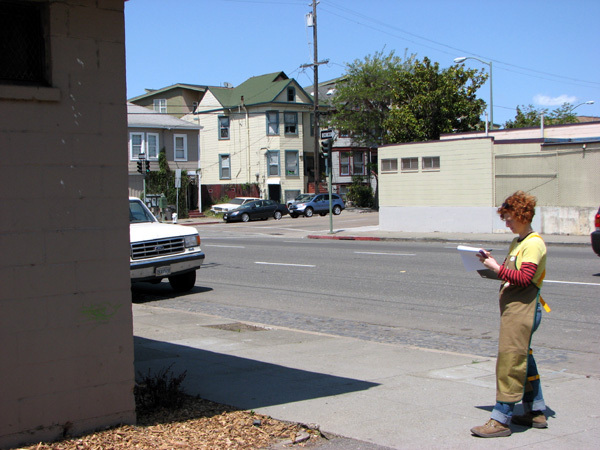 He has some photos of the neighborhood pre-freeway that he’ll share with us. Neighborhood historians are a real treasure! 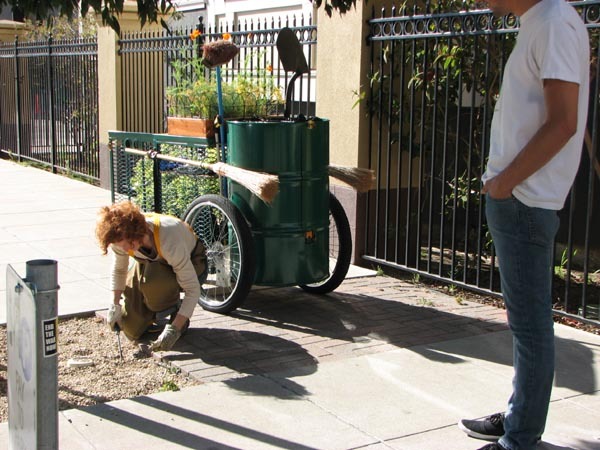 On our way to the galleries, we stopped along the way to tend to the street tree wells: most of the wells collect wind-blown trash and are verdant weed gardens. 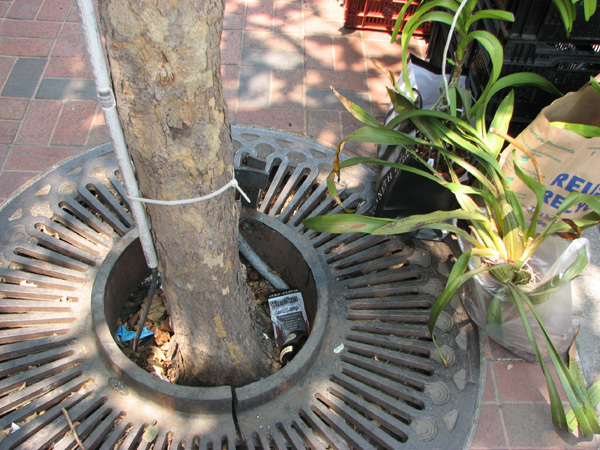 Most of the trees appear in good condition, but some have out-grown their metal tree well supports. 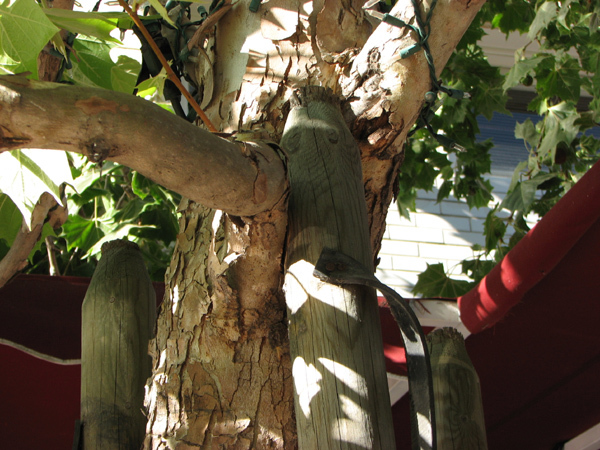 Other trees have engulfed their wooden supports. We’ll contact Public Works about the situation. We were stopped by neighbor with a gardening SOS: he is the building manager for the Ninth Street complex that houses the Museum of Children’s Art. They had just removed all of the cacti in the plaza’s beds since they are hazardous for kids. 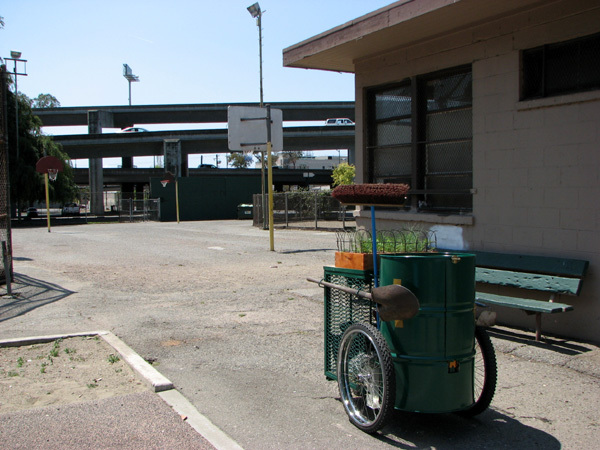 We brainstormed about some drought-tolerant plants for the beds: salvias, lavender, bunch grass. We hoofed and pushed uptown to Grand via Broadway. The city in general was desolate: closed shops and hardly any foot traffic. 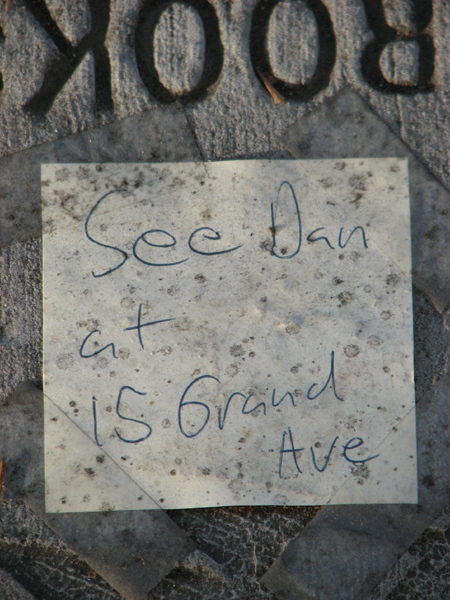 By the time we reached the gallery zone, the sidewalks began to pulse with people. 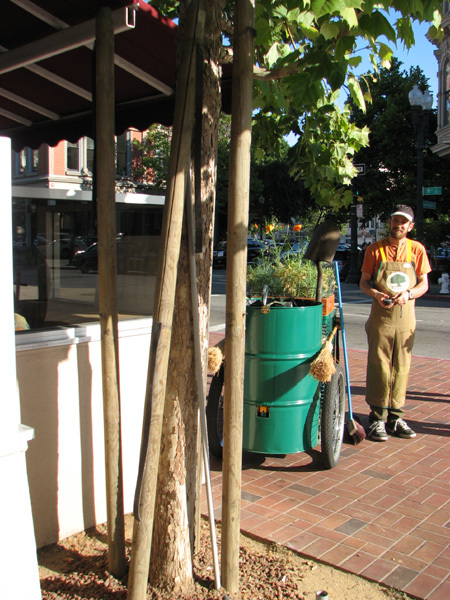 We thought that we could tend the street trees on Grand and were shocked to see that there was only ONE lonely tree! 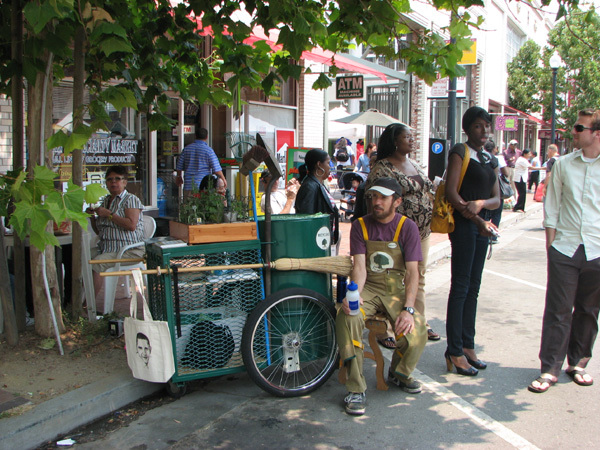 Gallery hoppers are a curious bunch: we had lots of people test out our portable bench and talk to us about our project. Most of the people we talked to had no idea that downtown boasts several great parks. Out of about twenty people we talked to, about 25% were from Oakland. So we know that we have to get the word out so more people can enjoy these parks. We arrived in Jefferson Square Park around mid-day. It was sparsely populated; a few people were lounging inthe ball field. This atmosphere of this park is greatly influenced by the strong presence of the freeway: The Cypress runs nearly through it. It some areas of the park the freeway is so loud that it’s hard to talk. Still, it seems like with some TLC and continued use, this park could become a vibrant green space. We talked to someone sitting on a bench who said that after church let out (2PM), people would probably be playing basketball. Today we began to survey the park and assess the condition of its: greenery, irrigation, recreation areas, picnic areas, hardscape, litter, lighting and overall safety. There are two tot lots under an inviting oak tree, a baseball field, basketball court, ping pong table and hand-ball wall. The rec center is closed and now fenced in. We nearly completed the survey; overall the park is serviceable even if it feels somewhat abandoned. We’ll attach a PDF of our completed survey soon. As we headed over to nearby Lafayette Square, we ran into Richard who was waxing his car. He told us some stories about the park “back in the day” when the ball courts were jamming, lovers were sitting out under the trees (before the freeway was there), guys were always playing some serious games of horse shoe, and kids looked forward to lots of picnics and barbeques. In the sixties, when many of the homes in this area were demolished to make way for the freeway, BART and housing developments, the park changed dramatically. Most of the people who had lived in the neighborhood moved to East Oakland. A lot of what Richard told us was this: parks remain vital when the surrounding neighborhood is intact and connected. 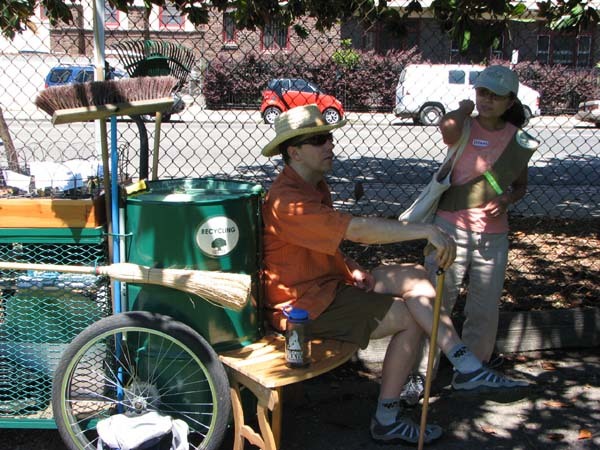 We will be making our first visit to Jefferson Square Park on Sunday, April 20, 2008. We will be surveying the park using the Parks Coalition's stewardship survey form. We will post our results along with some photos and GPS information after our visit.